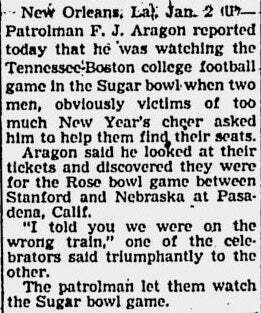 This newspaper clipping, from the January 2, 1941 issue of The Bend Bulletin, is a welcome reminder that football fans have always been drunk and dumb. It's just too bad these guys were born 70 years too early to be able the live-tweet the time they went the wrong bowl game but still got to watch it for free. That would have made for a pretty great Deadspin post.